The Orion 25 Cooler in the Dorado color. The challenge of keeping food cold seems to have undergone a revolution since I was tent camping full-time almost ten years ago. 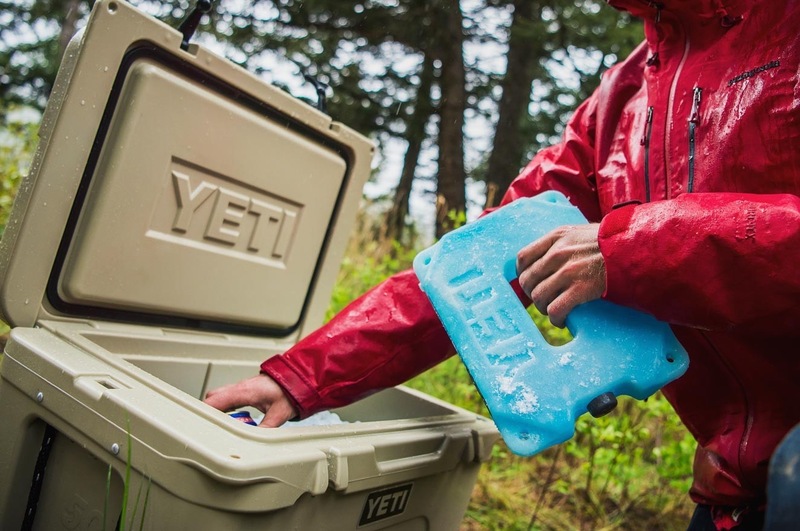 Heavy-duty coolers sold by Yeti and its competitors now chill food and drinks for up to a week in hot weather (and even longer in moderate weather) without an ice change, but prices also are very high. After reading a lot about these expensive coolers, I think that they may have the potential of being helpful to some people pursuing mold avoidance. Hopefully their use will allow some mold avoiders to more easily get out into remote areas for extended periods of time without having to resort to eating whatever random toxic food might be locally available; without needing to spend the money and effort to bring along a generator or solar system in order to run a refrigerator; and without being forced to constantly focus attention on the chore of buying and replacing cooler ice. However, these coolers also have their downsides, meaning that they are not always going to be appropriate even for those who can afford them. For one thing, because they contain large amounts of insulation, they can take up a large amount of available space in the vehicle. In addition, most of these coolers can be moved only with the combined efforts of two healthy people when they are full. 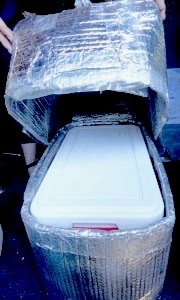 In many cases, even the medium-sized coolers when empty may be too much for a sick person to be able to move when alone. Figuring out logistics on how to handle and periodically drain the cooler therefore is really important for our purposes. While there may be some exceptions (such as for those traveling with healthy and fit family members), I tend to think that the heavier high-end coolers are going to be useful for most mold avoiders only if they can be kept in one place all the time rather than needing to be moved around. A wheeled 70 Qt. Rubbermaid cooler similar to the cooler that I used to use when tent camping out of an SUV. For instance, for those who are traveling with a cargo van or a cargo trailer, the cooler could be placed right next to the back door, allowing it to be periodically drained through its drain hole or with a siphon hose. Those who are not set up for the cooler to be drained in this way may find that they are much better off with a different kind of cooler, such as an ordinary lighter plastic cooler with wheels (which is what I used to have) or a smaller heavy-duty cooler (such as less than 40 quarts) that they can lift even when it is full. In short, choosing the right cooler is not just a matter of picking the most expensive or most attractive product and then being done with it. Rather, it likely will require some thought with regard to what the goals for the cooler are going to be and how the problems associated with it are going to be solved. Today’s high-end coolers are larger and heavier than other coolers of the same size, due to the presence of large amounts of insulation as well as thicker plastic materials. In most cases these coolers are rotomolded, though very high-quality coolers may be made using other manufacturing techniques as well. These coolers are intended to be once-in-a-lifetime purchases and usually contain at least two inches of insulation on all sides and in the lid. Although it is unlikely that those purchasing these coolers will end up discarding them, I suggest not stressing out too much about choosing the exact right cooler to meet all needs into the future. 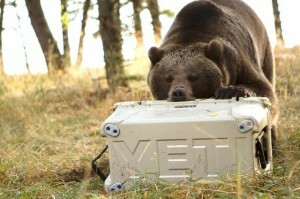 Yeti Coolers are bear-proof only when locks are added. The resale market for these coolers is very good, meaning that if a decision is made down the line that a different cooler would be more appropriate, selling the existing unit and using the money to buy something else should be a fairly simple process. Following is a rundown of the most frequently discussed heavy-duty cooler brands. Yeti (which has factories for its hard coolers in Iowa, Wisconsin and the Philippines) seems to really dominate the market for higher-end coolers, with most owners seeming very satisfied with their purchases. Almost everyone seems to concede that Yeti makes a pretty good cooler. However, the previous sense that the brand is in a category of its own and that no other coolers are as good seems to be dwindling very fast, and the company recently lowered the prices on some of its mid-sized coolers to be more competitive. A good thing about buying a Yeti is that at least in the current marketplace, used Yeti coolers sell very quickly for almost the same price as new ones, meaning that the long-term financial risk of buying one is pretty low. Other high-end coolers likely can be resold at good prices too, but perhaps not quite as easily since the Yeti brand name is better known. The model names of the Yeti coolers have the potential of being misleading since the numbers used do not accurately reveal how much food and ice the company’s coolers will hold. 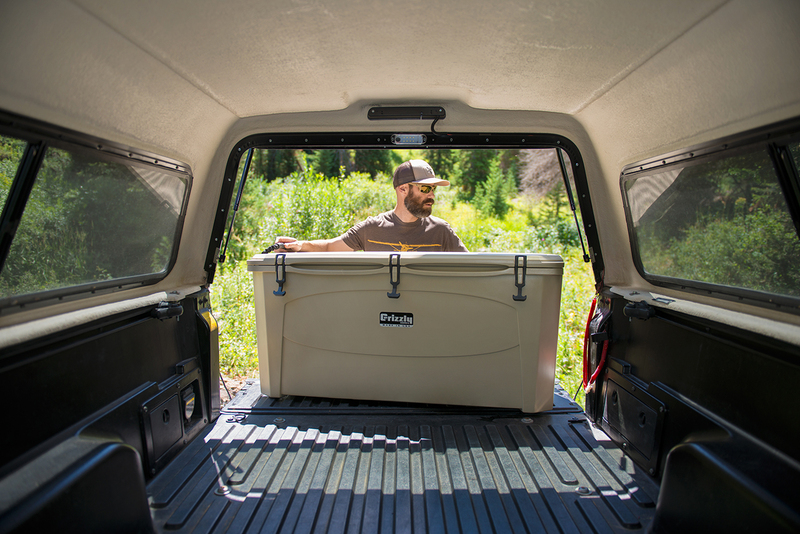 The Yeti Tundra 45 actually has an interior volume of only 38 quarts, for instance. Also, although Yeti coolers have a reputation for holding up well, the warranty period is only five years. Grizzly (which manufactures all its coolers in Decorah, Iowa – about 100 miles from my house) is somewhat less expensive than Yeti and includes a lifetime warranty on its coolers. 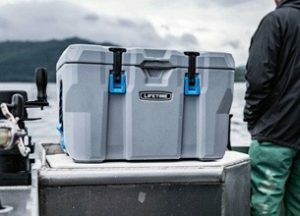 A few different comparison tests suggest that some of the larger Grizzly coolers (such as the 40 quart one) may not perform quite as well as the Yeti or some of the other high-end coolers with regard to ice retention. However, the company’s 20-quart cooler came in as #1 in ice retention compared to many different high-end coolers in a couple of different match-ups. Grizzly coolers are inherently bear-proof, without the need to buy and use special locks such as the Yeti coolers require. I’ve not yet had a bear go after my cooler, but I did have raccoons successfully break in and steal all my food once. Presumably the Grizzly latches – which are guaranteed to protect against “bears and other animals” – would keep out raccoons too. Grizzly is currently in the process of introducing a new line of mid-range hard coolers with a little less insulation than their flagship coolers, under the name Kenai Coolers. An Engel Deep Blue cooler with a camouflage lid. 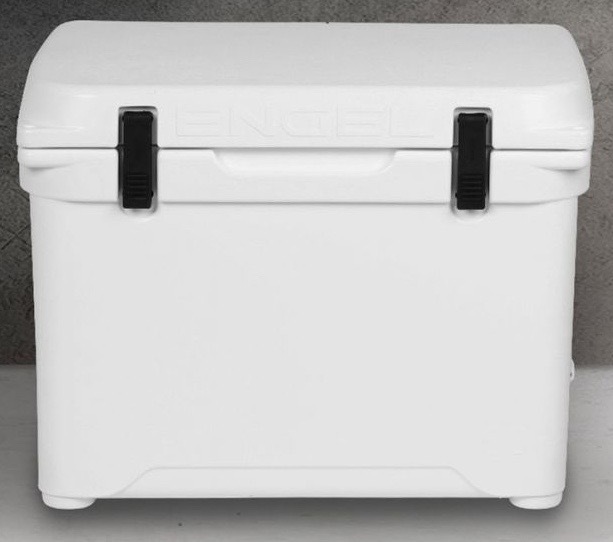 Engel (a Japanese company) pioneered the category of rotomolded coolers more than a decade ago, prior to Yeti being founded. The brand appears to be very respected by reviewers and well-liked by purchasers. It is seeming a little less trendy at the moment than some of the other cooler brands, but that could change. Engel Deep Blue rotomolded coolers are made in Thailand and have a limited warranty of 10 years. Their cooler names are only vague approximations of the internal cooler volume – for instance, the Engel 45 actually holds 47 quarts, but the Engel 25 holds only 21 quarts. 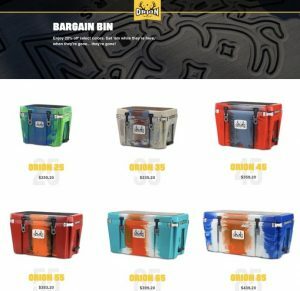 Orion coolers are considerably more expensive even than Yeti (!) and have more premium features. 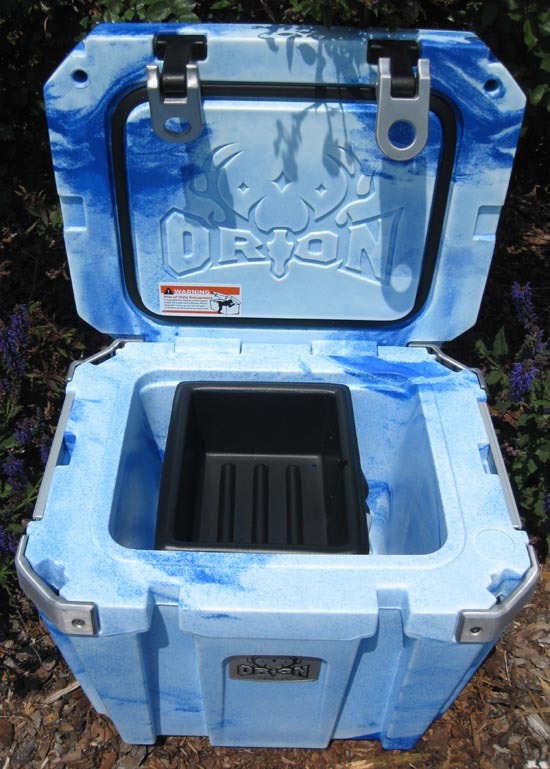 A high-quality foam padded top (a $80+ accessory on other coolers) comes standard on Orion coolers, for instance. 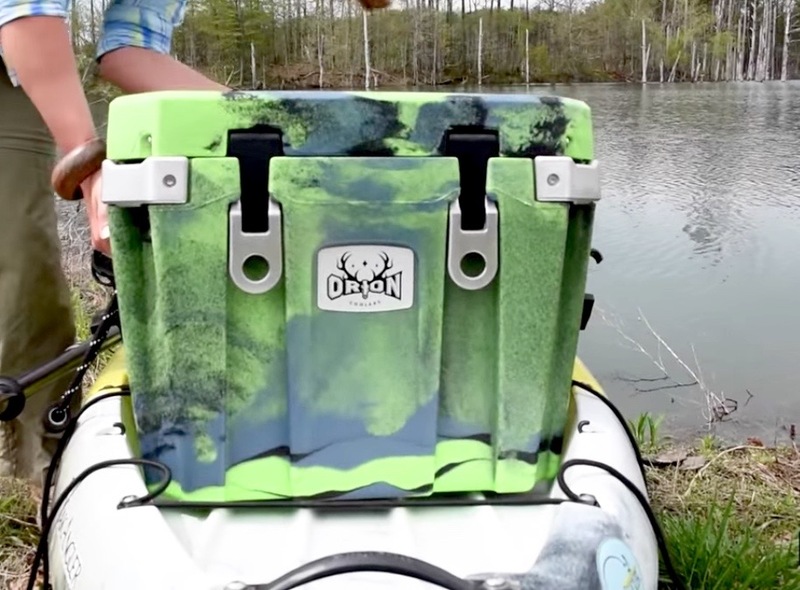 Orion coolers are made in Sparta, Tennessee, by Jackson Kayak. The ice retention seems to be about the same as with Yeti coolers. The limited warranty is 10 years. 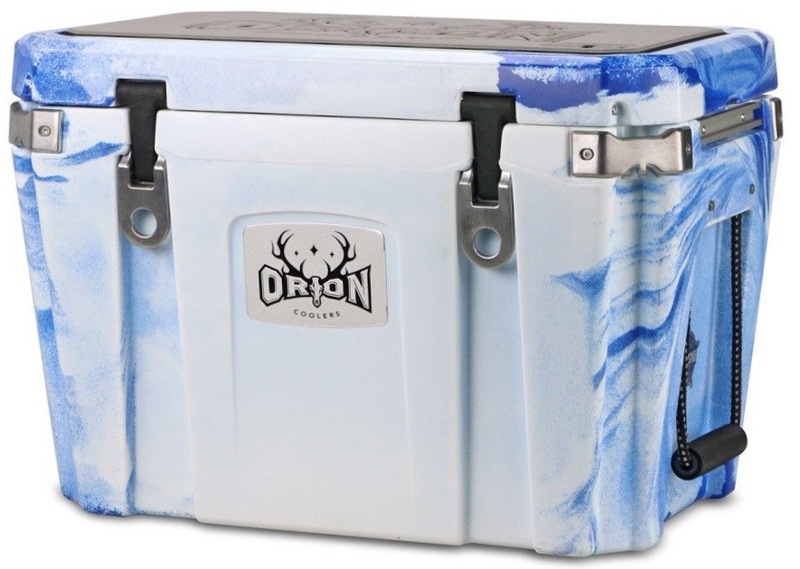 While most of the Orion coolers have a tie-dyed appearance that I find extremely attractive and while they seem to be excellent coolers all-around, I’m finding it hard to justify spending $100 or $200 extra just because I like the way they look. Maybe if I saw one in person I would change my mind about that though. An ORCA 40-Qt. Cooler with a sports theme. 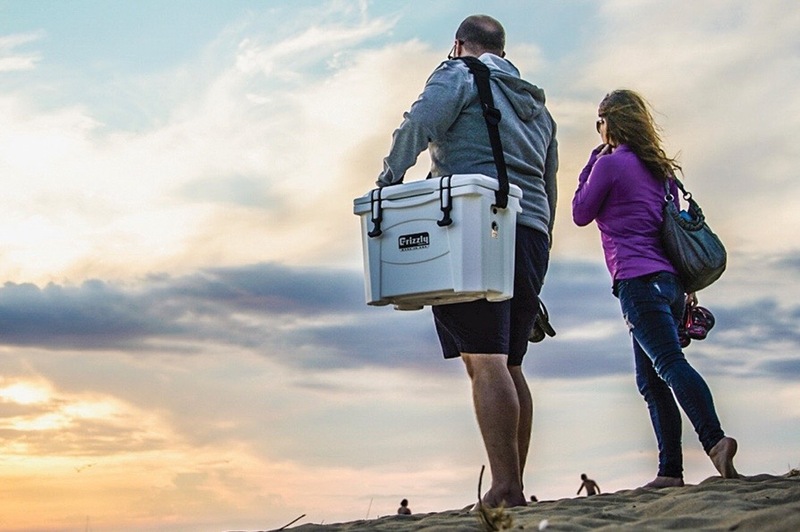 ORCA (Outdoor Recreation Company of America) coolers are made in Tennessee and are growing rapidly in popularity, especially in the South. 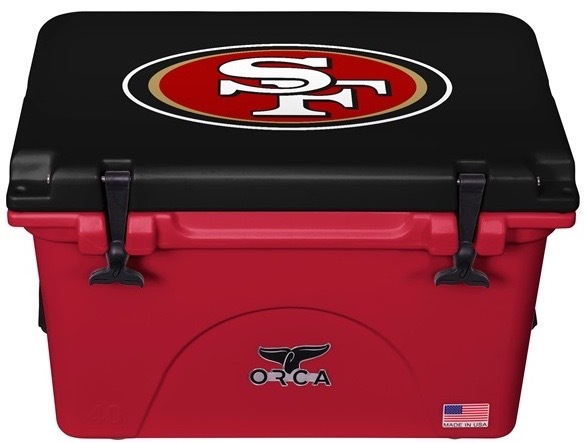 The ORCA product focus is on coolers that are sports-themed, NRA-themed, patriotic, camouflaged or brightly colored. Many of these coolers are quite expensive, due to the use of hand-painted “hydro dipped” lids. The company also is introducing a series of “LiddUp” coolers where an LED light comes on inside whenever the lid is raised. The general quality and ice retention ability of the ORCA coolers themselves are reported to be very good. 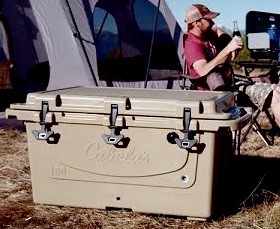 Cabela’s makes coolers that seem to be designed mostly for devoted hunters – super-rugged and bear-proof and with consistent best-in-class ice retention, and made in the U.S., but also very bulky compared to competitors’ coolers. In particular, their handles are really huge. This may be helpful for carrying purposes but also results in a great deal of inefficiency in the context of living in a van or cargo trailer. The smallest Cabela’s cooler (25 qt.) lacks a drain hole, which further removes it from the consideration set for me. Some of the Cabela’s coolers that I saw at the store (including the tan ones) had a pretty strong offgassing smell to them. All Cabela’s house brand products have a limited lifetime warranty against defects in workmanship. 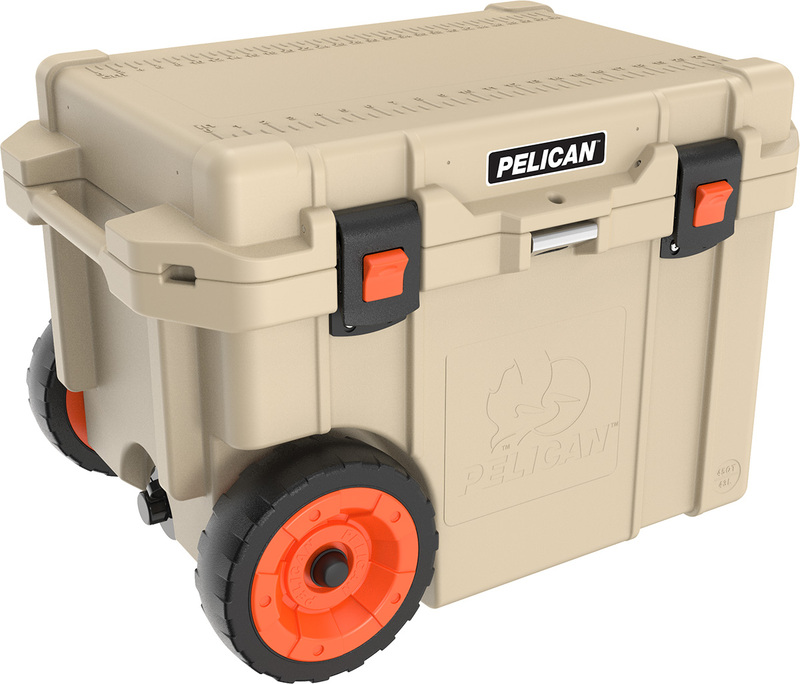 Pelican is based in Torrance, California, and the coolers are made in the U.S. The coolers are reported to have excellent ice retention. A few of their larger coolers have wheels. Pelican coolers also include molded handles that stick out quite a bit on either side. Although the issue is not as problematic as with the Cabela’s coolers, it still makes them somewhat inefficient for use when living in a van or a cargo trailer. Pelican coolers are backed up by a lifetime guarantee on any breakage, which is a good thing since I have seen quite a few complaints about products needing to be sent back due to their drain plugs leaking. In general they seem to be especially rugged as coolers go though. The Vibe Element is a newer cooler line being sold by a well-known kayak company. The coolers (which are made in China) are considerably less expensive than Yeti coolers and seem to be generating really positive comments both from professional reviewers and from purchasers. Vibe coolers are rumored to be the exact same coolers (but in different colors) as those being sold by a few other companies, including Fat Boy, Milee and Driftsun. 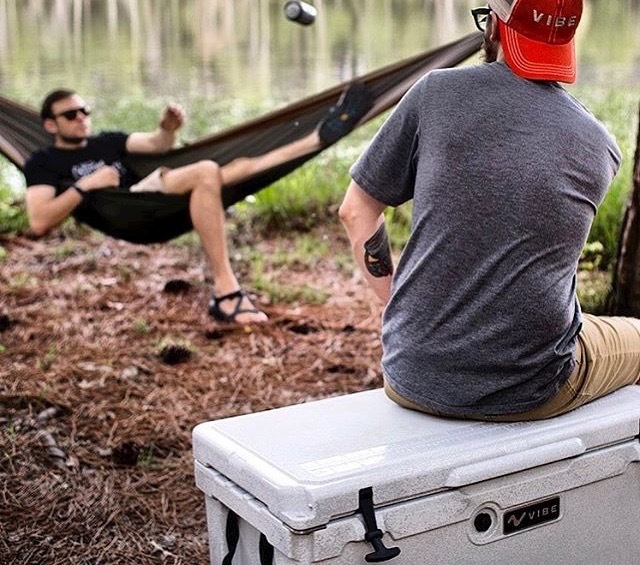 However, Vibe – which is offering a limited lifetime warranty on its coolers – seems to be generating the most positive comments of the bunch, due to its apparently good customer service, its strong reputation in the kayak industry, and its particularly low current price point of $200 on its 75-quart cooler. Whether the Vibe coolers match Yeti on ice retention is as of yet unclear. However, from what I can tell, the race seems to be reasonably close and the overall general quality of the Vibe coolers is reported to be quite good. RTIC coolers seem to be a direct copy of Yeti coolers (to the point that Yeti filed a lawsuit against them), but are made in China and are at a significantly lower price point. RTIC coolers themselves mostly get very good reviews, but some people complain about customer service issues if they need to have a problem addressed. The warranty is for one year. 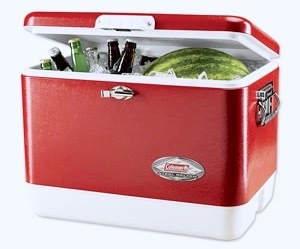 Items from the Igloo Sportsman line of quality rotomolded coolers are often available at discounted prices at retailers such as Walmart and Costco. 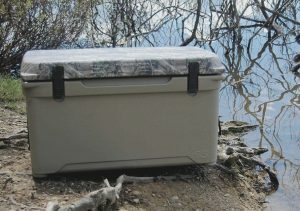 The Igloo Sportsman coolers are made in the U.S., have a 5-year warranty, and have come up as well-rated by reviewers. The Walmart Ozark Trail brand also offers a line of rotomolded coolers, at prices that are considerably lower than those charged for all the other rotomolded coolers that I have come across. While almost everyone seems to admit that the Yeti and Ozark Trail tumblers are similar in quality (at least in terms of ice retention), the Ozark Trail coolers are reported to have to have some quality control issues especially with regard to leakage from the drain hole. I also have seen reports that they may not be as good as Yeti and some of the other brands in terms of ice retention. 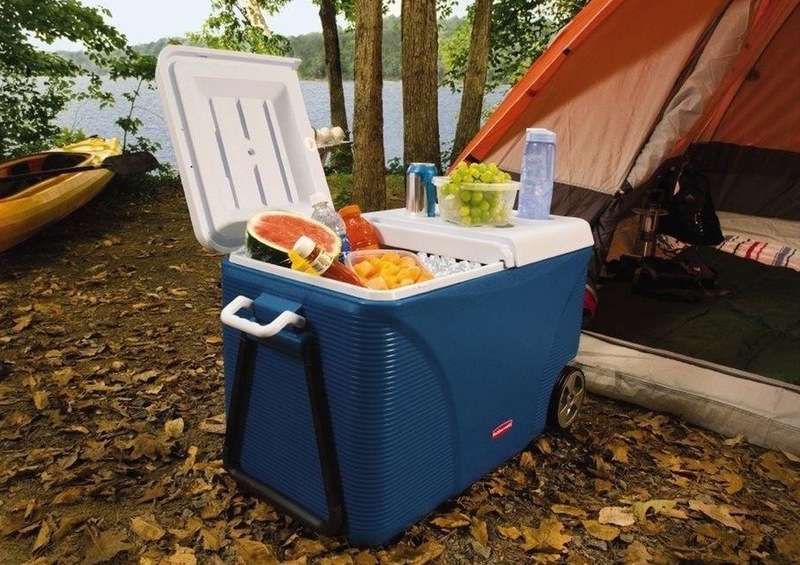 The Walmart Ozark Trail 26-Quart Cooler. 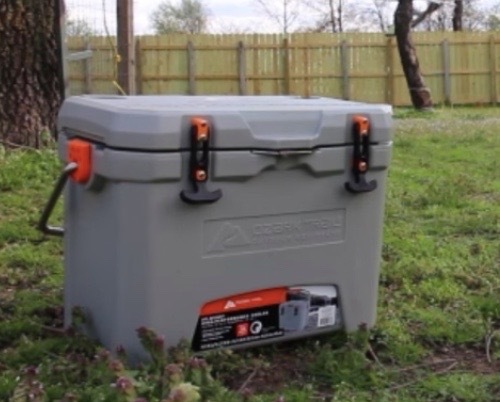 On the other hand, the Ozark Trail high-performance coolers have oversized drain holes that also are threaded for a garden hose; are certified as bear resistant; and have a limited 5-year warranty. I took a look at the Ozark Trail coolers stocked at my local Walmart. I thought that they were much better than most of the non-rotomolded coolers (and some of the other rotomolded coolers) that I have seen in terms of lack of offensive plasticky offgassing smell and that they also looked pretty nice. Depending on how the price comparison works out, I think they could be worth considering in some cases. Finally, Coleman very recently introduced a pair of Heavy Duty Super Coolers (55-quart and 85-quart) that are similar in features to Yeti but with a style that is a little reminiscent of their classic 54-Quart Steel Belted Coolers. 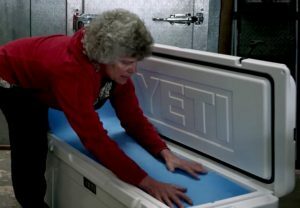 The new Coleman Super Coolers have 2.5″ of insulation on all sides, are said to retain ice for 6-7 days in temperatures of 90F, and are bear-proof, for instance. Coleman is based in Wichita, Kansas, and these coolers are made in the U.S. 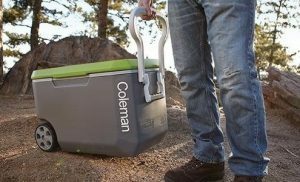 Although they are being positioned as new coolers, a little digging suggests that they seem to be just a relaunch of the Coleman Esky coolers, except with a different name and some new colors available. The Coleman 55 Qt. Heavy-Duty Super Cooler. The Coleman Esky coolers hit the market a couple of years ago, and there are just a few reviews available on websites and on Amazon. The reviews suggest that this cooler is very heavy and built like a tank, and that the best use seems to be keeping it in one place in a boat as a sort of non-electric refrigerator rather than trying to move it. The cooler has a 6-year limited warranty against manufacturer defects. The price point is considerably higher than Coleman’s other coolers but still lower than similarly sized Yeti coolers. Walmart Ozark Trail Cooler (No Drain Hole), 26 Qt. $86. 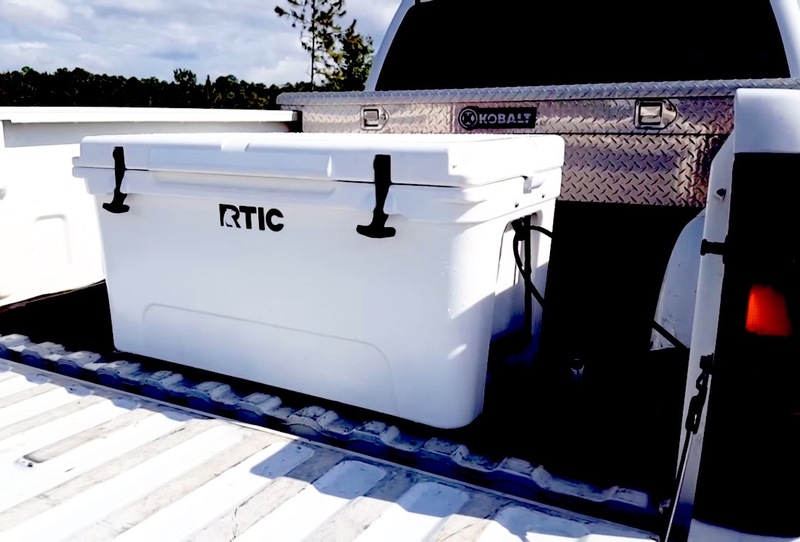 RTIC Cooler, 20 Qt. $108. Vibe Element Cooler, 20 Qt. $130. Engel 25 Cooler, 21 Qt. $150. Grizzly Cooler, 20 Qt. $175. 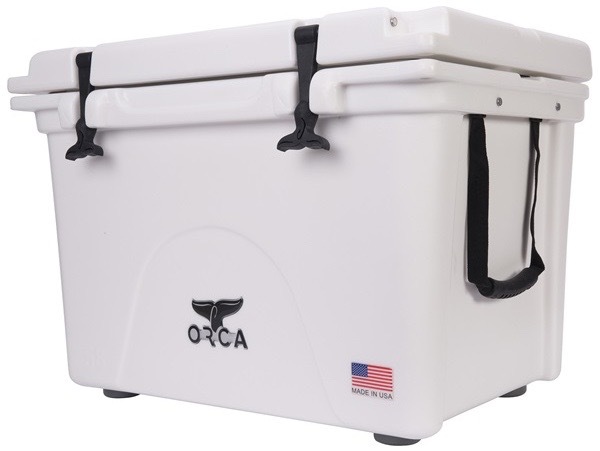 ORCA Cooler, 20 Qt. $190+. Cabela’s Polar Cap Equalizer Cooler (No Drain Hole), 25 Qt. $200. Yeti Roadie Cooler, 20 Qt. $200. Igloo Yukon Cooler, 20 Qt. $219. ORCA Cooler, 26 Qt. $220+. Orion Cooler, 25 Qt. $369. Engel 35 Cooler, 35 Qt. $200. Pelican Elite Cooler, 30 Qt. $225. Yeti Tundra 35 Cooler, 30 Qt. $250. Yeti Tundra 45 Cooler, 38 Qt. $300. Orion Cooler, 35 Qt. $419. RTIC Cooler, 45 Qt. $152. Vibe Element Cooler, 45 Qt. $170. Grizzly Kenai Cooler, 45 Qt. $180. Milee Heavy-Duty Iceland Cooler, 45 Qt. $200. Grizzly Cooler, 40 Qt. $225. Engel 45 Cooler, 47 Qt. $230. Igloo Sportsman Cooler, 40 Qt. $238. Engel Cooler 50, 48 Qt. $250. Cabela’s Polar Cap Equalizer Cooler, 40 Qt. $250. Igloo Sportsman Cooler, 40 Qt. $254. ORCA Cooler, 40 Qt. $270+. 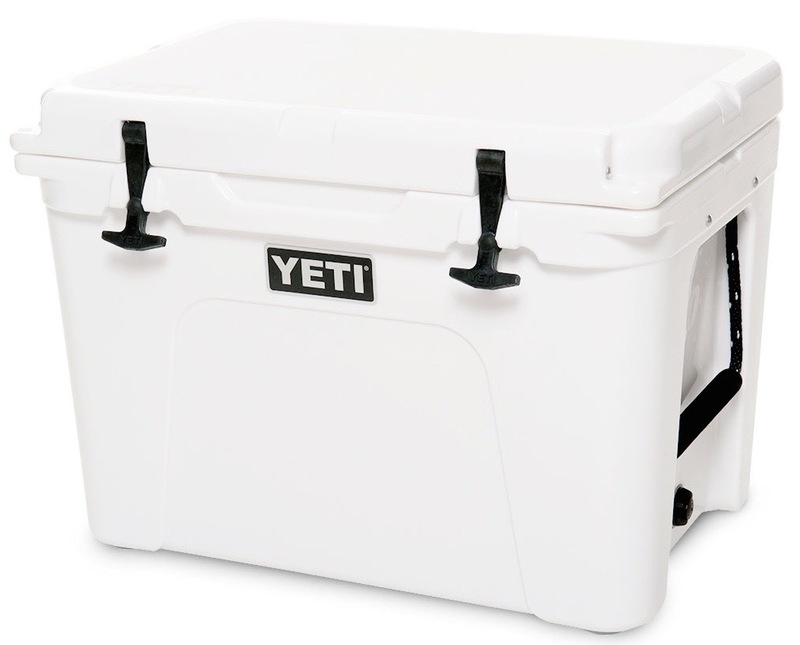 Yeti Tundra 50 Cooler, 47 Qt. $330. Pelican Elite Wheeled Cooler, 45 Qt. $380. Orion Cooler, 45 Qt. $449. Walmart Ozark Trail Cooler, 52 Qt. $137. Igloo Sportsman Cooler, 55 Qt. $279. Coleman Super Cooler, 55 Qt. $279. Engel 65 Cooler, 58 Qt., $280. 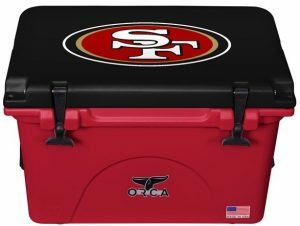 ORCA Cooler, 58 Qt. $300+. Pelican Elite Cooler, 50 Qt. $350. Yeti Tundra 65 Cooler, 57 Qt. $350. Orion Cooler, 55 Qt. $479. RTIC Cooler, 65 Qt. $192. Walmart Ozark Trail Rolling Cooler, 60 Qt. $197. Grizzly Cooler, 60 Qt. $250. Engel Cooler, 65 Qt. $280. Cabela’s Polar Cap Equalizer Cooler, 60 Qt. $300. Orion Cooler, 65 Qt. $499. Walmart Ozark Trail Cooler, 73 Qt. $184. Vibe Element Cooler, 75 Qt. $200. Vibe Element Cooler with Wheels, 70 Qt. $260. Milee Heavy-Duty Wheeled Cooler, 70 Qt. $299. Grizzly Cooler, 75 Qt. $300. Engel 80 Cooler, 74 Qt. $300. Igloo Sportsman Cooler, 70 Qt. $320. Engel 85 Cooler, 78 Qt. $320. Pelican Elite Cooler, 70 Qt. $350. 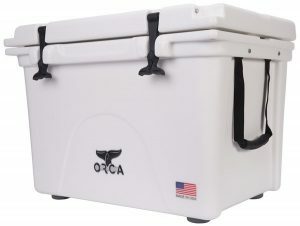 ORCA Cooler, 75 Qt. $350+. Yeti Tundra 75 Cooler, 75 Qt. $450. Coleman Heavy-Duty Super Cooler, 85 Qt. $300. Yeti Tundra 105 Cooler, 87 Qt. $480. Pelican Elite Wheeled Cooler, 80 Qt. $500. Orion Cooler, 85 Qt. $549. Grizzly Cooler, 100 Qt. $350. Engel 123 Cooler, 108 Qt. $400. Cabela’s Polar Cap Equalizer Cooler, 100 Qt. $400. 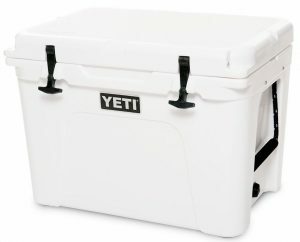 Yeti Tundra 110 Cooler, 96 Qt. $500. Pelican Elite Cooler, 95 Qt. $500. For those who do not need, cannot afford or are not set up to be able to use these higher-end storage coolers, a number of other very good cooler choices exist. One of my favorite coolers, for instance, is the classic Coleman 54-Quart Steel Belted Cooler. The Coleman 54-Quart Steel Belted Cooler. This is same basic cooler that Coleman introduced in 1954. It is made in the U.S. and seems to have a big fan following of people in addition to me. The cooler is metal on the outside and (with the exception of a disappointingly substandard lock) seems to be very nicely made. The Coleman Steel Belted Cooler is available at a moderate price point (listed at $130 but often marked down to less than $100). It is, in my opinion, a lovely cooler (I’m especially partial to the red version) that I would really enjoy having in my van or as an an extra seat or table at my campsite. Because the outside is mostly metal, it might be easier to keep from being cross-contaminated from environmental toxins as well. Unfortunately, this Coleman cooler seems to fall considerably short of higher-end coolers in terms of its ice retention, meaning that – at least when it is hot outside – I might need to be buying ice for it on a daily or near-daily basis. The Coleman Xtreme 5 70-Quart Cooler. 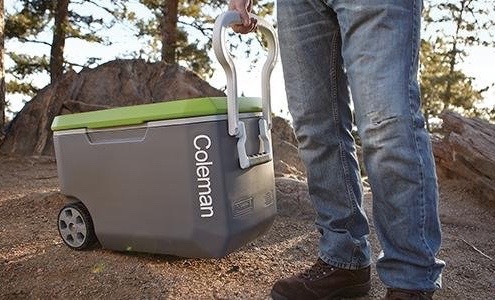 From what I have seen in reviews, the people who seem happiest with the Coleman Steel Belted Cooler are those who are basically using it as an old-fashioned ice box – that is, with a block of ice on the bottom of the cooler, and then a large shelf on top of the ice to hold various items as if they were in a refrigerator. This seems to work because block ice lasts much longer than ice cubes and because melted ice will continue to keep food reasonably cool for a while (a good thing provided that the food does not need to be kept super-cold and does not get waterlogged). I think it also would be an excellent cooler for shorter trips or for those who do not mind spending a bit of time on a daily basis attending to their cooler ice situation. Another good cooler option from the same company is the Coleman Xtreme line of coolers. This is a line of relatively inexpensive non-rotomolded plastic coolers that nonetheless are reported to keep ice from melting for a very long time (in some cases almost as long as Yeti coolers). They are made in the U.S. The Coleman Xtreme Marine coolers (which are white with steel latches and an antimicrobial coating) seem to get especially good reviews. The main problem that I have noted when looking at the Coleman Xtreme coolers (as well as many other inexpensive coolers) in stores is that they seem pretty plasticky smelling. In addition, due to issues with the hinges and other similar construction problems, these coolers may not be expected to last for more than a few years, especially if used regularly. Although Coleman Xtreme coolers may be found in a variety of online and local retailers, and on the Coleman site, the best prices that I have found for them have been from Walmart. Another value-oriented cooler available at some Walmart stores (as well as a few other retailers) is the Lifetime 55-Quart Cooler. Although the cooler looks heavy-duty on the surface, reports are that it is considerably less durable than the higher-end coolers offered by other manufacturers. For instance, while the cooler is bear resistant in that bears will not be able to get to the food inside the cooler, a company video suggests that the cooler is likely not going to be very usable after the bears finally give up on it. There also are reports that this cooler has the tendency to leak, from the area around the lid (this can be seen in the bear video too) as well as from around the drain hole. Where the Lifetime cooler excels, however, is in ice retention – keeping its contents frozen nearly as long as competitors charging two or three times the price. The Stanley 30-Quart Adventure Cooler. Thus far, there is just one size (55 quart) and one color (light gray with teal accents). The cooler is manufactured in the U.S. and the user reviews seem quite good so far. 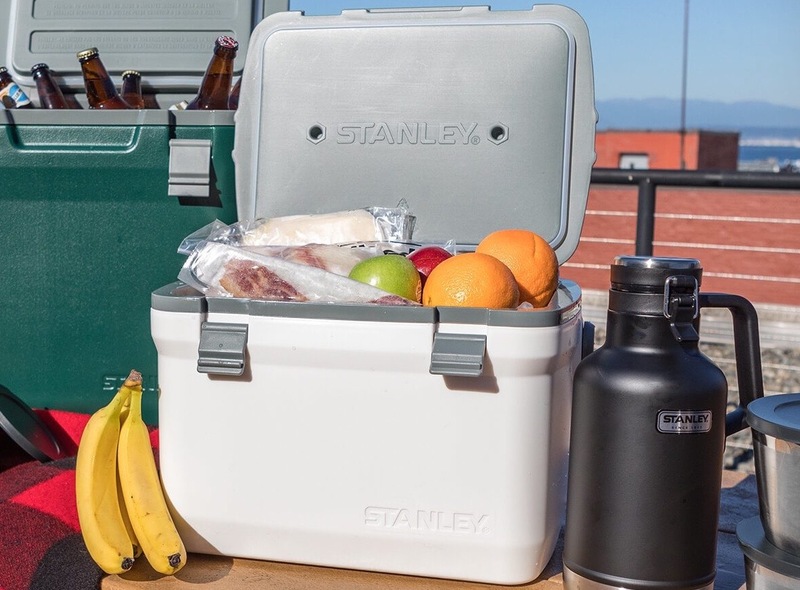 Also possibly worth noting is that Stanley – which also offers a successful line of hard plastic smaller coolers used as lunch boxes – recently introduced a 30-quart Adventure Cooler. The price point and reputed quality are somewhat lower than most of the rotomolded coolers but quite a bit higher than many of the other plastic coolers on the market. In its advertising, Stanley is calling attention to the fact that its coolers take up less space than rotomolded coolers. Of course, this comes at the cost of ice retention. Stanley is claiming the ice in this cooler will last four days (compared to 27-36 hours in its smaller coolers). I have not seen any objective testing yet though. Like all other Stanley products, Stanley coolers are manufactured in China. 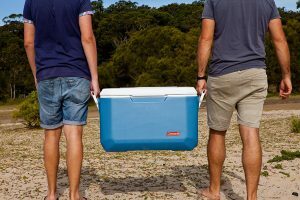 Based on what I have seen with the smaller Stanley coolers, I think that this larger cooler probably could be a pretty good choice for people who do not need their ice to last for a really long time but nonetheless want a decent quality product. Quite a few other larger coolers also are available at much lower prices than any of these models, of course. I have not seen any others that I would expect to compare on either ice retention or quality construction, though probably there are some out there. Note that from what I have seen of non-rotomolded coolers, larger coolers of 30 quarts or more virtually all have drain plugs, while smaller coolers never do. The version that I owned back in the day had wheels on it, and I found those to be very helpful when taking the cooler out of my SUV to change the ice or for general campground use. The Coleman Xtreme 62-Quart Wheeled Cooler. One problem that I have with many of these less expensive coolers is that at least at first, the plastic produces a lot of offgassing. This tends to be especially problematic when the coolers are open. I did not have any problem at all with the Coleman Steel Belted Cooler with regard to this though. Although I have not yet seen the Stanley 30-quart cooler, the similar smaller Stanley coolers have only mild offgassing issues by my standards. The Rubbermaid coolers that I have encountered also haven’t seemed too bad with regard to offgassing, and therefore conceivably could be worth a look and a sniff. Coleman Xtreme 3 Cooler, 28 Qt. $22. 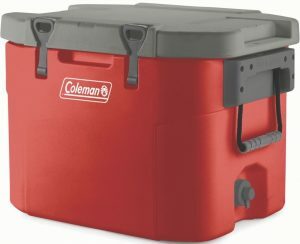 Coleman Cooler with Bail Handle, 28 Qt. $24. Igloo Marine Contour Cooler, 25 Qt. $24. Coleman Party Stacker Cooler, 25 Qt. $29. Rubbermaid Cooler, 24 Qt. $36. Coleman Xtreme Cooler, 28 Qt. $40. Coleman Xtreme Cooler, 52 Qt. $41. Coleman Performance Cooler, 48 Qt. $45. Igloo Sportsman Cooler, 52 Qt. $45. Rubbermaid Durachill Cooler, 50 Qt. $74. Lifetime Cooler, 55 Qt. $97. Stanley Adventure Cooler, 30 Qt. $150. Coleman Steel Belted Cooler, 54 Qt. $150. Coleman Xtreme5 Cooler, 70 Qt. $44-62. Coleman Xtreme Marine Cooler, 70 Qt. $50. Coleman Xtreme Cooler, 120 Qt. $54-75. Coleman Xtreme Marine Cooler, 120 Qt. $63. Igloo Quick and Cool Cooler, 100 Qt. $67. Igloo Island Breeze Roller Cooler, 28 Qt. $35. Coleman Xtreme Wheeled Cooler, 50 Qt. $30. Rubbermaid Extreme 5-Day Wheeled Ice Chest, 75 Qt. $53. Coleman Xtreme Wheeled Cooler, 62 Qt. $54. Coleman Xtreme Marine Rolling Cooler, 40 Qt. $60. Coleman Xtreme Wheeled Marine Cooler, 100 Qt. $74. Coleman Offshore Pro Series Marine Wheeled Cooler, 82 Qt. $130. One thing that surprises me about all these high-end coolers is how little thought their manufacturers seem to have put into the question of how to allow those using them in their vehicles to easily drain them. The medium- and large-size coolers (especially when full) generally can be moved only with the combined efforts of two strong people, for instance. The Pelican Elite 45-Quart Wheeled Cooler. Worse for our purposes, even the smallest of these coolers when full would be a challenge for a sick person to lift. Although a few of the cooler companies, such as Pelican and Ozark Trail, make some wheeled models, most do not. I’ve found two coolers that are supposedly capable of being drained through a regular garden hose – the new Coleman Super Coolers and the Walmart Ozark Trail coolers. Yeti sells an optional hose plug that allows this with their coolers as well (though some purchasers state that they have found that plug to have leakage problems). According to Amazon buyer reports, the Yeti plug will work for the copycat RTIC coolers as well. In most cases though, manufacturers seem to be assuming that the cooler will be lifted out of the truck by two strong men and carried to a location where it is okay if the water sprays all over the place when the drain is removed. While this may work fine for group hunting trips, it is not a workable solution at all for sick people traveling in an RV or van (especially on their own but even with another person). A garden hose attaches to the Coleman Super Coolers for drainage. In the case of the Coleman Super Cooler or Ozark Trail Cooler, or with the attachment that fits the Yeti/RTIC coolers, it seems like the threaded drain plug could be permanently attached to a garden hose shut-off valve so that when it is time to drain the cooler, a hose can be attached to the drain plug without water spraying all over the inside of the RV or van. Especially with all the complaints about the Yeti drain plug tending to leak, I still am not convinced this is going to work, but it could be worth a try. I am thinking that a better solution may be to drop a siphon into the top of the cooler and to use that to direct the water through a hose to the outside of the RV or van. Although there are plenty of siphons available that seem like they would work fine for this, I would be inclined to spend the $25 or so on one of the better-quality ones since I would prefer that the frequent chore of draining the cooler be as simple and pleasant as possible. Because a pet peeve of mine is fishing my food out of a sea of ice-cold water, I also for sure want to get the elevated shelf that sits on the bottom of any cooler so that food remains dry as the ice melts. 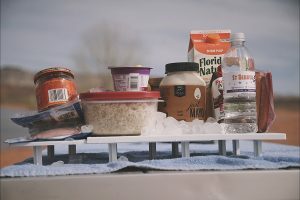 While most high-end coolers have a small basket for dry goods that comes standard with purchase, it seems to be assumed by manufacturers that almost all food will be stored sitting on top of or mixed in with the ice. However, I for one would be very interested in a large shelf – such as the one that fits the Coleman Steel Belted Cooler – that would give me plenty of room to store bulky items like produce that I would prefer to be kept chilled but not frozen. The Cooler Tray by Ice-Olate. Some food storage containers – such as ones made by ClickClack – may come in handy for consolidating smaller items such as butter, cheese, mayonnaise, mustard and luncheon meats, I think. Most cooler manufacturers sell dividers for their coolers, and I would be interested in one of those as well (especially if I couldn’t find a good tray to fit in a particular cooler). For instance, I might put all my ice and frozen meat on one side of the divider, and then put items such as milk and kombucha – which I would like to keep cool rather than frozen – on the other side. Some cooler companies sell feet for their coolers that allow them slide more easily across floors than the standard feet do. This conceivably could be helpful for drainage purposes, since the cooler could be moved nearer to the door to be drained without it needing to be lifted. Regardless of the type of feet used, I am thinking that I want to get a padlock for my cooler so that I can attach it with a chain to one of the D rings on the floor of my van. The Coleman Cold Glow Cooler Light. This is primarily for safety reasons since it would prevent the cooler from flying forward and causing an injury if I ever were in an accident, but it also will serve as protection from thieves since nice coolers (especially Yetis) are big targets for them. If finding things in the cooler is a challenge at night, then a cooler light may be helpful. The Coleman Cold Glow Cooler Light has automatic off/on (motion-activated) and manual settings. It will run for 40 hours without a battery change. The Coghlan’s Cooler Light has only an automatic setting but automatically shuts itself off after 20 seconds of continuous use (apparently as a reminder to everyone not to leave the cooler lid open for very long). Camco TastePure Drinking Water Hose. $7. Mintcraft Brass Garden Hose Shut Off. $8. Yeti Drain Plug Hose Connection. $13. GasTapper Siphon Pro XL. $29. ClickClack Cube Food Storage Container, 1-4 Qt. $13+. Coleman Cooler Food Tray. $19. The Cooler Tray by Ice Olate. $25. Coleman Cold Glow Cooler Light. $13. One possibility to make ice last longer is to add more insulation to the outside of the cooler – for instance, by covering it with Reflectix (reflective metallic bubble wrap) or blankets. Foam insulation also could be attached to the outside of the cooler. A cooler cover made out of Reflectix. Photo Credit: Cheap RV Living. 3) Use plenty of ice (possibly even 2x as much ice as food contents if dry ice is not being used). 4) If the cooler starts out at room temperature or higher, use one or two “sacrificial” bags of ice in it overnight to cool the insulation before packing the cooler with fresh ice and food. 5) Food that is put in the cooler should start out as cold as possible (e.g. pre-chilled drinks, frozen meat). 6) Open the cooler as infrequently as possible. 7) Keep the cooler organized so that it does not sit open while you look for things in it. 8) Use flexible foam pads between the ice and the food, and also on top of the food, to help keep things organized as well as to repel heat. Adding flexible foam pads to the top of the cooler to protect contents from heat. Photo Credit: Yeti. 9) If not much food needs to be kept cold, it is a bad idea to use only a small amount of ice in a large cooler since the large surface area will cause the ice to melt very fast. A better idea may be to get a smaller inexpensive foam cooler and to fill it completely with contents and ice, and then to put that cooler inside the larger cooler with some additional ice at the bottom to chill the insulation. While it often is suggested that melted cold water be retained in the cooler until new ice can be added, one controlled test suggested that this may not be as important as some people make it out to be. Personally, I think that the difference is likely small enough that I would go ahead and drain the water if I were afraid that my food would get wet if I didn’t. Another factor that seems to be really important with regard to ice retention but that isn’t talked about much is cooler color. Obviously, white reflects light and dark colors absorb light. As it turns out, this can make a very big difference in terms of the outside temperature of even a tan cooler vs. a white one, and it makes sense to me that this would have an effect on the temperature inside the cooler as well. 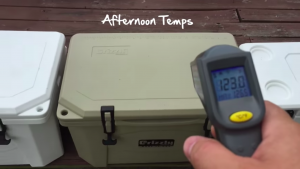 An ice challenge test looking at tan vs. white Grizzly coolers. Photo Credit: Coolers on Sale. One controlled matchup of a light tan versus a white Grizzly cooler showed no difference in ice retention, even though the coolers were sitting in the sun for several days during the summer in Florida. A second match-up with the same coolers showed a small amount of difference (with ice lasting for 3.5 days in the white cooler vs. 3 days in light tan cooler). My suspicion here is that where the big difference comes in is when the cooler (and especially the cooler lid) is a really dark color such as red or navy blue rather than a light tan. Orion coolers, for instance, seem to be considerably more insulated than Yeti coolers but come up about the same in competitive ice tests. I am thinking that probably is because most of the Orion coolers – including the ones that have been used for the tests – use darker colors on their exteriors and also have a black mat on the top. Especially if the weather is really hot and the cooler will be sitting in the sun, covering it with a white or metallic tarp so that the heat is reflected away from it seems like it would make a big difference and mostly compensate for a darker cooler color. The Orion Cooler used in the Field & Stream cooler comparison test. Still, common sense seems to suggest that probably choosing a cooler that is a lighter color – preferably white but at minimum something like light aqua or light blue – would be the best idea with regard to maximizing ice retention. Since the inside of my cargo van is white-painted steel, probably white is the best choice for me from an aesthetic point of view as well. Unfortunately though, while other colors in many of these high-end cooler lines occasionally can be found on sale, the white ones seem to almost never be discounted. Still, since white inherently seems to make the most sense as a cooler color, I am thinking that perhaps I should get a white one even if it is more expensive. Adventure Journal – Is It Better to Drain The Cooler? 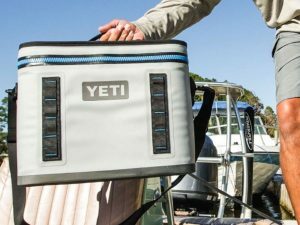 Regardless of the color, Yeti coolers rarely seem to go on sale anywhere, and the other high-end cooler brands seem not to be discounted very often either. In addition, counterfeit Yeti mugs appear to be extremely common online, and so I wonder how common fake Yeti coolers in particular and fake high-end coolers in general are being sold out there on the Internet. Discontinued Orion colors available in their Bargain Bin. Therefore, although I often buy other products via Amazon or eBay, I personally would be a little hesitant to buy any a high-end coolers – especially Yeti coolers – from anywhere other than an authorized retailer or the factory. One thought that I have is that REI occasionally has sales (usually in May and then again at some point during the holiday season) where members can get one item that they sell for 20% off. 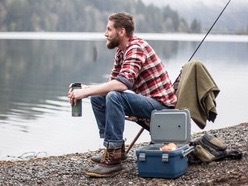 Provided that Yeti coolers are included in future promotions, it seems that especially if a larger cooler is desired, buying it during one of these REI sales could provide a substantial cost savings over the regular price. Cabela’s periodically has site-wide 10% off sales for its cardmembers, with purchases of Yeti coolers apparently being eligible for the discount. For those who – like me – covet an expensive Orion cooler, discontinued colors may be found at discounted prices (such as 20% off) on the company website. I also occasionally have found a few current colors of Orion coolers at discounts of up to 25% off from individual dealers by doing a Google Shopping search. 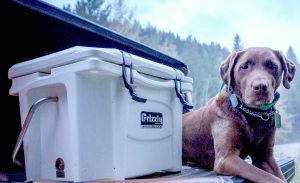 Some other cooler companies – such as Grizzly – also offer discounted colors on their websites. As a general rule, coolers are broken up into the categories of 20 Quart (which seems possibly appropriate for storage of food but not drinks for two people for maybe a day), 30-45 Quarts (possibly appropriate for two people for a couple of days), 50-65 Quarts (possibly appropriate for two people for several days), 70-90 Quarts (possibly appropriate for two people for up to 5-6 days) and 95+ quarts (possibly appropriate for two people for up to a week or more). 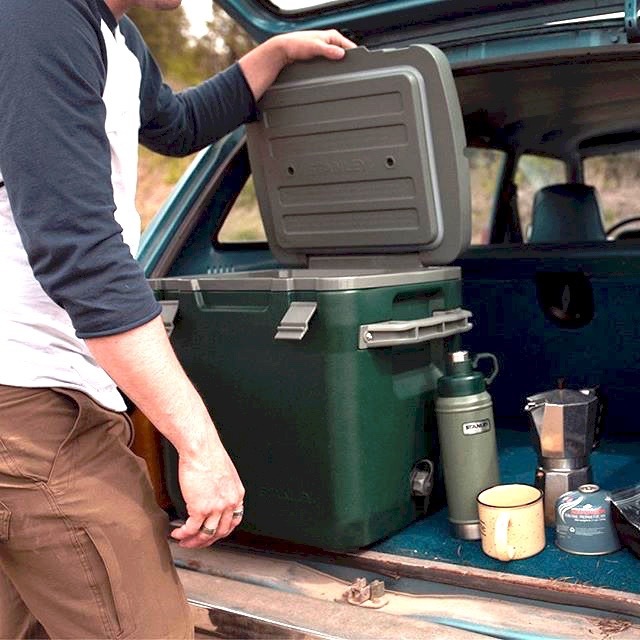 A 165-Quart Grizzly Cooler providing a little less than 6 cubic feet of storage space for ice and food. Of course, the amount of storage space needed can vary significantly depending on what kind of refrigerated food is being consumed (e.g. produce, dairy products and beverages will take up more room); whether food that does not need to be kept chilled (such as grains, beans or canned goods) is a significant part of the diet; how many people are being fed; and how big everyone’s appetites are. Only after comparing the available space in a cooler to that of a refrigerator did it become clear to me how limited the space in a cooler actually is. Standard home refrigerators in the U.S. typically are 15-30 cubic feet. The RV refrigerator that I used to have in my Casita (which seemed an appropriate size to meet most of my basic needs while on the road) was 4 cubic feet. While a 60 quart cooler is technically 2 cubic feet, generally it is recommended that coolers be stocked with only 50% food so that the rest of the cooler can hold ice. In some cases – especially in hot weather or on long trips – an even higher ice-to-food ratio is often suggested. That being the case, it seems that even a large heavy-duty cooler will provide only a fraction of the storage space as does a modest-sized RV refrigerator. The main reason for this is that coolers with a great deal of insulation have a relatively small percentage of storage space compared to the total size of the cooler. A heavily insulated Orion 25-quart cooler. That is especially the case with smaller heavy-duty coolers, which usually have the same amount of insulation on each side (such as 2″) as do larger coolers from the same manufacturer. A higher percentage of storage space can be provided either by purchasing a less insulated cooler or by using less ice, but then ice retention will not be as great. While a heavily insulated smaller cooler will have limited storage space and still take up a lot of room in the car, overly large coolers present significant problems as well. For instance, they may take up a very high percentage of all available floor space, be difficult or impossible for one person to move even when empty, and require the purchase of large amounts of ice to keep them filled. Thinking hard about exactly what needs to be stored and how cold it needs to be thus is important. For instance, in my case, I realized that a high percentage of the food that I eat consists of fresh produce that does not need to be kept all that cold. I therefore have been considering buying an inexpensive lightweight cooler to use for the produce, rather than keeping it in my storage cooler at all. In addition, opening the storage cooler multiple times per day to retrieve cold drinks or snack foods causes the ice to melt much faster, totally defeating the purpose of buying a highly insulated cooler. It therefore seems to make sense to me to purchase a smaller cooler that I can access as many times per day as I like, leaving the larger storage cooler closed the vast majority of the time. A chart depicting the size of various Yeti coolers. From left: the Yeti Roadie (20 Qt. ), the Yeti 35 (30 Qt. ), the Yet 45 (38 Qt. ), the Yeti 50 (47 Qt. ), the Yeti 65 (57 Qt.) and the Yeti 75 (75 Qt.). If I use peripheral coolers for long trips, then it seems that the food that I may want to keep in a storage cooler will consist primarily of frozen meat and fish, milk, yogurt, kombucha, cheese, butter and eggs. In addition, almost all of these items (including the eggs if I hard boil them) can be kept safely at temperatures well above freezing and thus could be stored in a lightweight cooler if necessary. The storage cooler therefore only really will be needed to hold meat and fish (which I eat in only small amounts) and milk (which I can easily do without if necessary). Therefore, I am thinking that even for longer trips (such as a week or even two weeks) with two people to places where decent food is not expected to be available locally, probably I will be able to get away with a moderate sized cooler (such as 45-60 quarts). Since that seems to be the size cooler that I can reasonably easily handle on my own when it is empty, and that will be doable considering the available space in my van, it seems to be the right choice from those perspectives as well. In summary, I am thinking that probably the best size cooler for me will be something in the 45-60 quart range. It seems to me that anything smaller than that would not hold much food at all, but that anything larger would take up much too much space in my van and also would be very difficult for me to move by myself even when it was empty. For occasions when I am traveling with another person and will only have occasional access to good-quality food stores, this cooler may seem a bit on the small side. However, I think that by using less expensive supplemental coolers for some of my food, and if necessary by using less ice in the cooler and then replacing the ice more frequently, I can make it work. Because this size cooler weighs around 30 pounds empty and holds an additional 60 pounds of ice, I do not expect to be able to lift the cooler in order to be able to empty it when I am traveling on my own. Although at first I thought that wheels would be helpful, eventually I concluded that the best idea would be just to store the cooler right next to the back door in my van and then to never move it. Since the drain hole on the right side of the cooler will be pointing out the back opening, if I wanted to I could just open the drain and let the water spray out. Probably I will use a drain hose attachment or a siphon most of the time in order to keep the water a bit more under control though. In looking at the choices in the 45-60 quart size range, I realized that a few of the coolers were a little taller and a little narrower than the others, resulting in more of a cube shape rather than a bench-like shape. I think that this seems like it could be a good idea since it would result in the cooler taking up less floor space and also would be easier for me to carry on my own than a wide cooler would be. After some trial and error, I concluded that a cooler that was less than 28″ wide would be best for me. Also, I decided that in the interest of not having to change the ice as frequently, I would try one of the more expensive coolers to see how it worked for me. Although not everyone is the same, I tend to think that many mold avoiders who are traveling on their own or with a companion, in a van or cargo trailer, would have the same basic food needs and space needs that I have. Likely any of the coolers that I have been considering would work out pretty well for them, I think. On the other hand, if I were not currently so concerned about how long the ice in the cooler would last, then for sure I would choose the Coleman 54-Quart Steel Belted Cooler (24″x16″x16″, 19 lbs, 54 quarts, $150). I really like how this cooler looks and think that I would enjoy having it around. 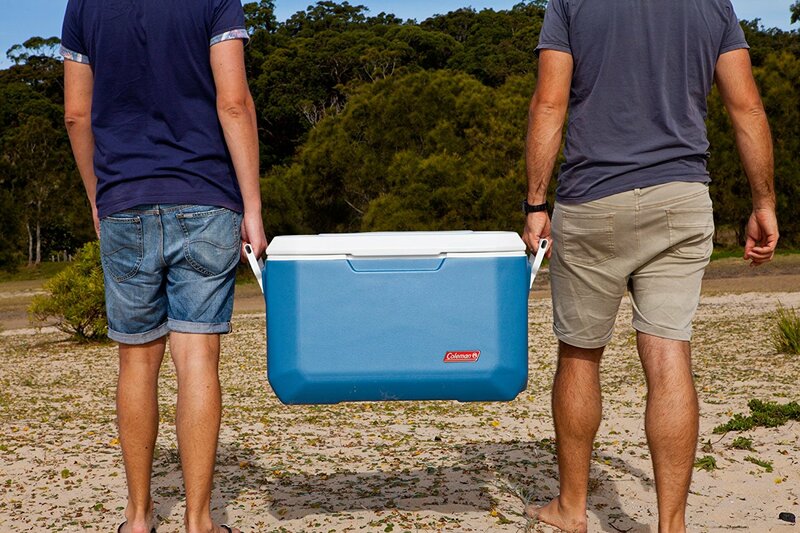 If I were less concerned about the width of the cooler, I would think a lot more about the Pelican Elite 50 Qt. (30″x20″x20″, 26 lbs., 50 quarts, $350). The Pelican actually is a good size and shape in terms of the cooler body, but the handles sticking out on either side would create an appreciable amount of inefficiency with regard to space that I cannot afford to waste with my planned micro-living setup. Another cooler that is about the same width as the Pelican but is more of a bench shape is the Grizzly 60 Qt. (30″x17″x17″, 30 lbs., 60 quarts, $250). I feel really drawn to the Grizzly brand (in part because they are a local company for me and because of their lifetime warranty), but my understanding is that their larger coolers have less insulating ability than many other heavy-duty coolers. They would need to be considerably less expensive than other similarly sized coolers as well as the right size/shape for me to consider buying one, therefore. If I wanted a wheeled cooler, I would consider the Pelican 45 ($380) or the Walmart Ozark Trail 60 Qt. ($197). If I were planning to travel away from civilization for long stretches of time on an indefinite basis rather than just occasionally, and if I had more floor space, and if I were always going to have a companion with me, then I very likely would choose a cooler in the 65-85 quart range. The Vibe 75 and the Coleman 85 Quart Super Cooler seem like they might be especially good values in that size category, but quite a few other choices seem like they would work out well too. In terms of my own choice, in addition to the choices from the top-rated brands, I have thought really seriously about the brand-new Coleman Super Cooler in the 55-quart size. I do think it might be a great cooler, but I am a little concerned about whether I would be able to easily carry it when it is empty and about the fact that the handles stick out a bit. 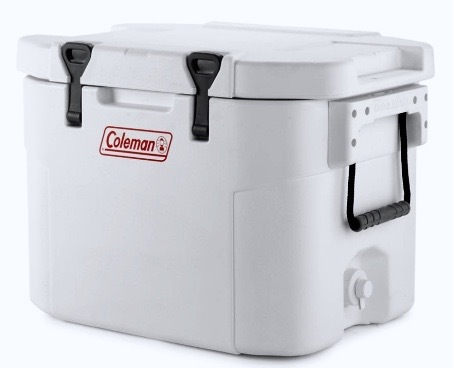 The Coleman 55 Quart Heavy-Duty Super Cooler. There also have not been very many reviews yet, and so buying it seems like taking a considerable risk at this point. I wish I could see one in person without having to order it. The Yeti 50 and the Engel 50 seem extremely similar in terms of their dimensions and in terms of their clean designs. It would be interesting to do a side-by-side comparison of them. Recently REI had a surprise sale in which members could get 20% off the price of one item, and so I decided to order the Yeti 50 (which I had never found in any local stores) to take a look at it. As it turns out, even though I have never been super-excited about Yeti coolers in general, I am feeling really good about this particular model. The narrow width (24″) feels almost elegant to me, making the cooler very easy for me to carry (at least when empty). I think it will fit compactly into the back of my van but also will hold a reasonable amount of food for my travels. All in all, it seems like a very safe choice, and the amount that I paid ($279 including sales tax) was only about $30 more than I would have paid for the Engel. I therefore am feeling fairly optimistic it will be a good choice for me. The Orion 45 in Sky Camo. 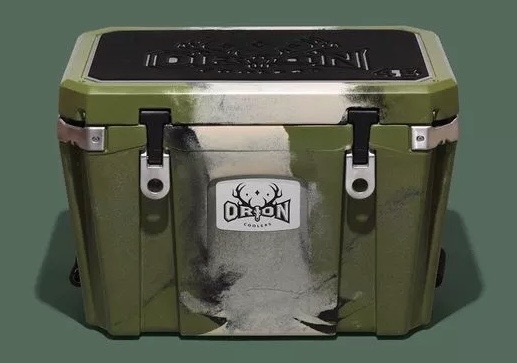 Still, I have been thinking a lot about taking it back and ordering an Orion 45 cooler instead, especially after I found what I think may be my preferred Orion color (“Sky Camo”) on sale from a kayak dealer for $337. My feeling about this cooler color is that it is really beautiful but still would be light enough not to interfere with ice retention very much, and so I am feeling really tempted by it. The extra money still would be a real splurge for me, but considering how much almost everyone seems to be in love with the Orion coolers once they try them out, maybe it would be worth it. The Grizzly 15 Personal Cooler. Even if an investment has been made in an expensive food storage cooler for an RV, a strong argument can be made for the idea of having on board one or more additional coolers. For one thing, reports from individuals who have purchased Yetis or other expensive coolers suggest that they are not very appropriate for storing produce since the temperature inside the cooler may be much too cold (thereby in some cases causing the produce to freeze). Figuring out a different way to store produce therefore seems a good idea. If the weather is not too hot, most produce will last for at least for a few days even just stored at room temperature in a brown paper grocery bag. The L.L. Bean Insulated Waxed Canvas Tote. For situations when access to good organic produce is only sporadically going to be available though, having the option of keeping fresh fruits and vegetables slightly chilled but not too cold may be helpful in extending their usable life. 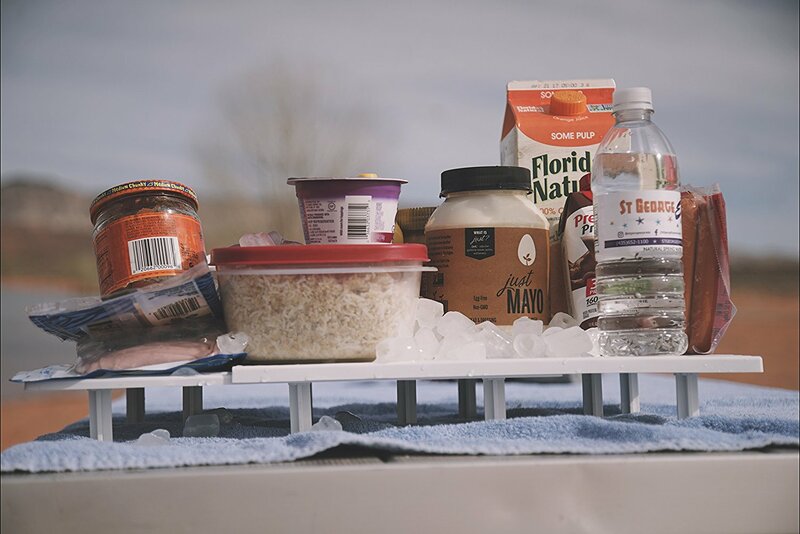 In addition, even if the expensive main cooler is always going to be in the back of the vehicle, having a smaller cooler on hand to store drinks, snacks and leftovers may be a good idea. The reason for this is because with a well-insulated heavy-duty cooler, the main factor that is going to cause the ice to melt is not infiltration of heat into the closed cooler but rather the cooler being opened by users. Limiting access to main cooler to just one or two openings per day can help the ice last much longer, thereby reducing the frequency with which the cooler will need to be drained and refilled. In considering possible coolers that could be used to store produce, the ones that seem to me to have the most potential feature a hard plastic case inside a soft insulated cooler body. Although these are lightweight coolers, it seems to me that the hard plastic case would serve to protect the produce and also could be very easily washed out as necessary. The 30 Can Arctic Zone Cooler. I have seen in stores several products of this type, with versions holding 12-15 quarts (30-40 cans) selling for between $20-30. Smaller versions also are available. 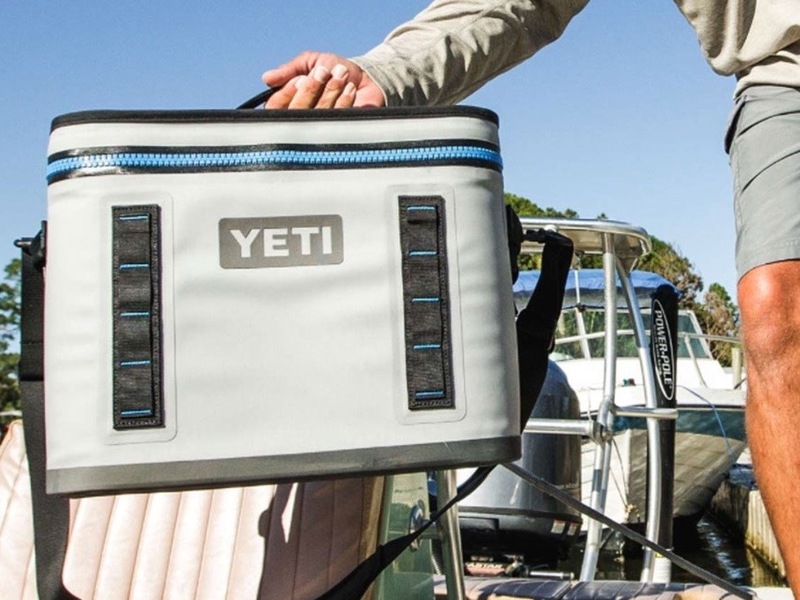 Versions of this kind of cooler include the Coleman Soft Cooler with Hard Liner, the Arctic Zone Zipperless Cooler, and the Walmart Ozark Trail Cooler with Removable Hardliner. The Arctic Zone version seems like it could especially useful since it has an upper shelf in it that could hold smaller items that do not need to be kept very cold, such as lemons, onions, garlic or tomatoes. The main problem with a cooler like this is that if ice is just dumped at the bottom of it, then when it melts all the produce will get wet and a big mess will result. In order to avoid this problem, I am planning to create my own “ice pack” by storing ice inside a sealable food container and then placing it inside the cooler. My hope is that this will help to keep the contents cooler than room temperature but not too cold, and that it will be very easy to just dump the water out of the container and add some new ice to it every day or two. Decisions about a “frequent use” secondary cooler may vary based on factors such as food and drink consumption habits, number of people using the cooler, amount of room available, and style preferences. Specifically, people who enjoy drinking ice cold beverages on a regular basis may want to invest in a larger or more expensive cooler so that more drinks may be stored and so that the ice doesn’t melt as fast. 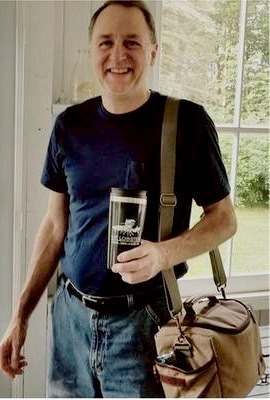 A customer photo of the L.L. Bean Heritage Softpack Cooler. Those who lean more toward room temperature drinks (such as plain water) or hot drinks may not need nearly as large or expensive of a secondary cooler (or in some cases may not need a secondary cooler at all). Personally, I don’t feel like I usually need my drinks to be that cold, and so I may just get a soft cooler that is more like a large lunch box (around 6-9 quarts) to store items that I want to access throughout the day. I also would be interested in the Cabela’s or the Arctic Zone Titan Deep Freeze coolers, each of which seems to include a moderate amount of insulation. To keep the cooler from becoming full of water as a result of melted ice, I am thinking that I will make my own ice packs using food storage containers. I also may try pre-chilling a purchased cooler pack – such as one made by Arctic Ice – in my large cooler and then using that to keep the smaller cooler cold. Another cooler that especially interests me is the L.L. Bean Insulated Waxed Canvas Tote. This is in large part because I like the appearance and materials of it, but I also think that the size (17″L x 12″ H x 6″ W) and styling might make it appropriate to carry around some other possessions – such as a small laptop, a tour book and a jacket – in addition to some food and drinks when spending time in town. The Yeti Hopper Flip 18. If I needed my drinks to be very cold but wanted to use a soft cooler, then probably I would look for a product with more insulation and a somewhat higher price, such as the well-reviewed A.O. Coolers Canvas Soft Cooler. The NorChill and Polar Bear products might be alternatives. Although it is hard for me to imagine spending $200 or more on a Yeti or Pelican soft cooler, it also is true that those get terrific reviews and that a lot of people apparently really love them. Maybe you need to like cold drinks more than I do in order to appreciate them. Arctic Zone Zipperless Cooler, 9 Cans. $10. Walmart Ozark Trail Cooler, 12 Cans. $10. Coleman Rugged Lunch Cooler, 10 Cans. $17. Cabela’s Soft Sided Cooler, 12 Cans. $20. Coleman Removable Liner Cooler, 9 Cans. $20. Coleman Soft Cooler with Hard Liner, 9 Cans. $30. A.O. Coolers Canvas Soft Cooler, 12 Cans. $50. Arctic Zone Zipperless Cooler, 16 Cans. $14. Walmart Ozark Trail Cooler with Removable Hardliner, 24 Cans. $15. Coleman Soft Cooler with Hard Liner, 16 Cans. $19. Coleman Removable Liner Cooler, 16 Cans. $25. Cabela’s Soft-Sided Cooler, 18 Cans. $25. Arctic Zone Titan Deep Freeze Zipperless Cooler, 16 Cans. $30. L.L. Bean Heritage Softpack Cooler, 6 Liters. $40. NorChill Voyager Soft-Side Cooler, 24 Cans. $60. A.O. Coolers Canvas Soft Cooler, 24 Cans. $70. Polar Bear Nylon Series Soft Cooler, 24 Cans. $90. Walmart Ozark Trail Cooler with Removable Hardliner, 36 Cans. $18. Arctic Zone Zipperless Cooler, 30 Cans. $18. 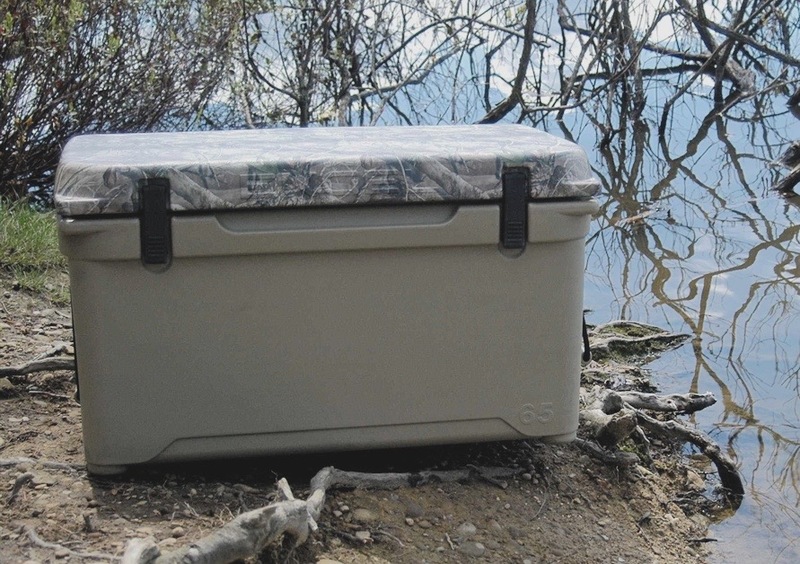 Cabela’s Soft-Sided Cooler, 30 Cans. $30. Coleman Removable Liner Cooler, 30 Cans. $30. Coleman Soft Cooler with Hard Liner, 30 Cans. $35. Arctic Zone Titan Deep Freeze Zipperless Cooler, 30 Can. $40. A.O. Coolers Canvas Soft Cooler, 36 Cans. $80. Arctic Zone Titan Deep Freeze Zipperless Cooler. $46. NorChill Voyager Soft-Side Cooler, 48 Cans. $80. A.O. Coolers Canvas Soft Cooler, 48 Cans. $90. L.L. 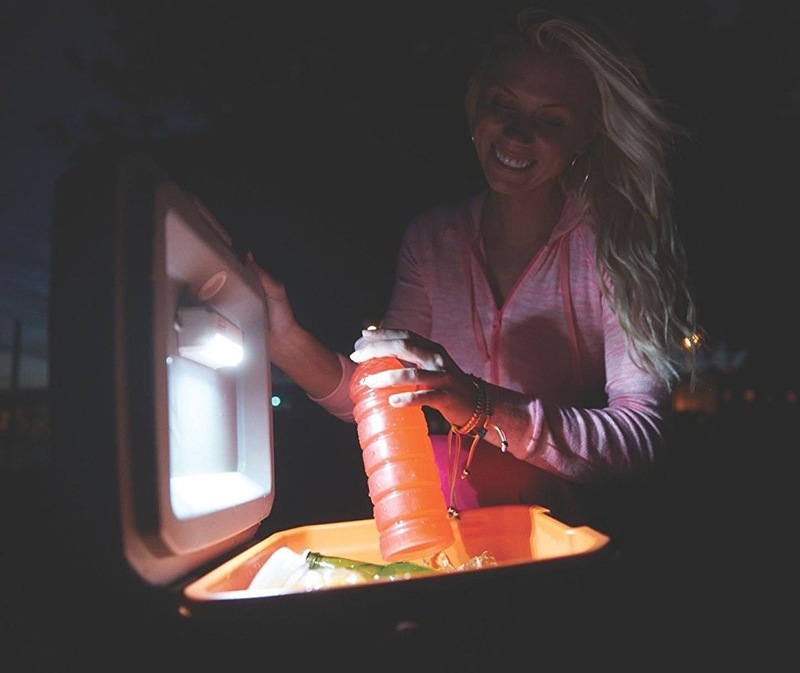 Bean Zipperless Cooler with Solar Light, 48 Cans. $90. Polar Bear Nylon Series Soft Cooler, 48 Cans. $120. L.L. Bean Insulated Tote (Medium), 17 Qt. $50. L.L. 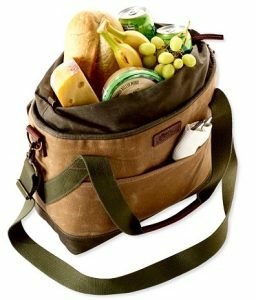 Bean Insulated Waxed Canvas Tote (Medium), 17 Qt. $60. L.L. Bean Insulated Tote (Large), 33 Qt. $70. L.L. Bean Insulated Waxed Canvas Tote (Large), 33 Qt. $80. Yeti Hopper Flip 8, 8 Cans. $200. Yeti Hopper Flip 12, 13 Cans. $250. Pelican Elite Soft Cooler, 24 Cans. $280. Yeti Hopper Flip 18, 20 Cans. $300. Yeti Hopper Two 30, 23 Cans. $300. Yeti Hopper Backflip 24, 20 Cans. $300. Pelican Elite Soft Cooler, 48 Cans. $330. Yeti Hopper Two 40, 34 Cans. $350. Rubbermaid TakeAlongs Sandwich Food Storage Containers, 2.9 Cups. $6. Komax Biokips Food Storage Sandwich Containers, 23 ounces. $14. Arctic Ice Alaskan Series Reusable Cooler Pack, 0.75-5 Pounds. $15-24. Cooler Shock Cooler Freeze Bags, 10″ x 9″. $23. Although soft coolers seem particularly appropriate for frequent use since they may be more easily moved around, smaller hard coolers may be appropriate as well. On the lower end, the Igloo Playmate line of hard coolers are very popular and seem to be of reasonably high quality. The Stanley 7 Quart Cooler. 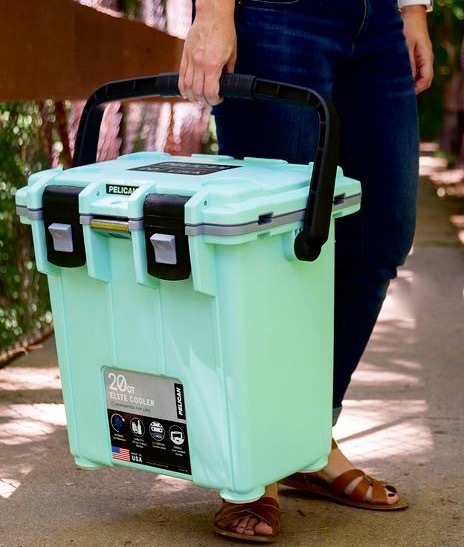 A lunchbox-style hard-sided cooler that gets good reviews is the Stanley Adventure Cooler, which is available in 7-quart and 16-quart sizes. Ice retention in the Stanley coolers is supposed to be excellent. I also like the fact that the design includes the ability to attach a full-size Stanley thermos to the top of the lid and that the 16-quart version can be used as a seat. Although reports suggest that the Stanley coolers (which are made in China) are not going to be as durable as higher-end coolers such as those made by Grizzly or Pelican, they also are much more moderately priced (listed at $40-70 and frequently discounted). Especially for people who are starting out with mold avoidance and are afraid that they are going to get their expensive plastic possessions permanently cross-contaminated, the Igloo Playmate or Stanley coolers may be a comfortable choice. The new white version of the Stanley 16 Quart Cooler. Finally, a couple of fairly large and heavy rotomolded coolers – the 15-quart Grizzly and the 20-quart Pelican Elite – seem more appropriate to me for frequent use than as storage coolers. These coolers both have a tapered shape that would allow them to fit nicely on the floor of the passenger’s seat in my van (or on the floor behind the driver’s seat in a conventional car), for easy access. The Grizzly 15 also has a shoulder strap for more portability. Unfortunately, despite the fact that both the Grizzly 15 ($125) and the Pelican Elite 20 ($150) are pretty large coolers, neither of them has a drain hole. I suppose this must be because the assumption is that the user is going to be dumping the ice and refilling the cooler every few days. Still, especially for someone who is not well, lifting a cooler weighing upwards of 40 pounds to pour out the ice may be a bit of a challenging task. As discussed in the previous section though, the use of a good siphon may resolve that problem. 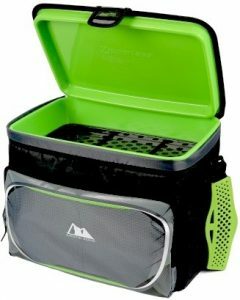 Both the Grizzly 15 and the Pelican Elite 20 (as well as the Grizzly 20, which does have a drain hole but also is higher priced) rank at the top of the heap compared to pretty much all coolers out there in terms of their ability to keep food cold for a long time using a single 20-pound bag of ice. 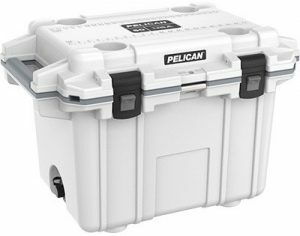 The Pelican Elite 20 Quart Cooler. In addition, these coolers have plenty of room for bottles of beer to be stored standing straight up, and the Pelican 20 can accommodate three bottles of wine. Compared to other higher-end coolers, these particular coolers actually are not all that expensive (apparently because adding a drain hole to a cooler contributes substantially to the manufacturing cost). For those who are planning on going on a long summer driving trip into the desert and who are counting on ice-cold drinks to help keep them comfortable, it is conceivable that one of these coolers might be a very good choice. Igloo Island Breeze Cooler, 9 Qt. $16. Coleman Excursion Cooler, 9 Qt. $19. Igloo Playmate Pal, 7 Qt. $30. Rubbermaid Cooler/Ice Chest, 10 Qt. $35. Stanley Adventure Cooler, 7 Qt. $40. Hard Coolers – 15-20 Qt. Coleman Party Stacker Cooler, 18 Qt. $22. Coleman Personal Wheeled Cooler, 16 Qt. $26. Igloo Playmate The Boss Cooler, 15 Qt. $29. Coleman Excursion Cooler, 16 Qt. $35. Igloo Playmate MaxCold Cooler, 16 Qt. $42. Stanley Adventure Cooler, 16 Qt. $70. Grizzly Cooler, 15 Qt. $125. Pelican Elite Cooler, 20 Qt. $150. My Casita travel trailer came with a Dometic refrigerator, which ran on propane gas (with a small amount of battery power needed to power the computer) or on electric power. It worked well for me, but after Erik Johnson reported having a major mold growth problem in his own similar refrigerator due to there being a piece of foil-covered cardboard buried in the insulation, I now think that I was lucky that it worked out for me as well as it did. Dometic and Engel also make expensive refrigerator/freezers (often close to $1000) that plug into the cigarette lighter of a vehicle for use when on the road (and that also run on AC power when available). They can be used to keep food either cold (like a refrigerator) or frozen (like a freezer). The Igloo Iceless Thermoelectric Cooler. Although these are mostly used by long-distance truckers, a number of mold avoiders have purchased them for use while camping without an RV setup. Although these 12V refrigerators seem to work fairly well, they do drain battery power quickly. They thus may be most practical when plans do not include boondocking without electricity in one place for any extended length of time or when alternative forms of power (solar power or a generator) are already set up and working well. Another option for road trips with a lot of planned driving could be a small and inexpensive 12V cooler (such as a Wagan or Igloo) that keeps foods at 30-40 degrees or so below the ambient temperature. These are intended only for items such as beverages and produce, rather than for meats and other items that need to be kept consistently very cold in order to prevent spoilage, however. Amazon Basics Portable Cooler and Warmer. $65. Igloo Iceless Thermoelectric Cooler. $120.